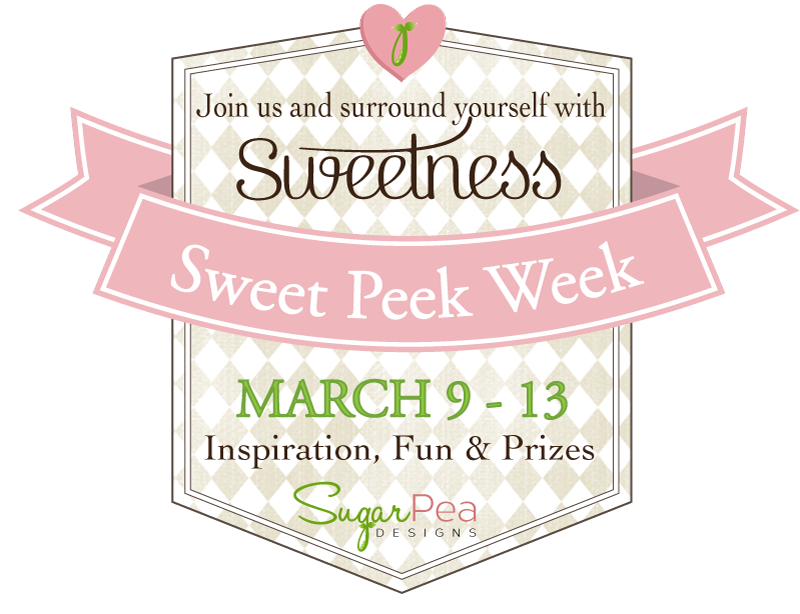 Hey there, Sugar Pea Designs fans! It's the second day of previews the new March release! There's so much more fun left to share this week too! 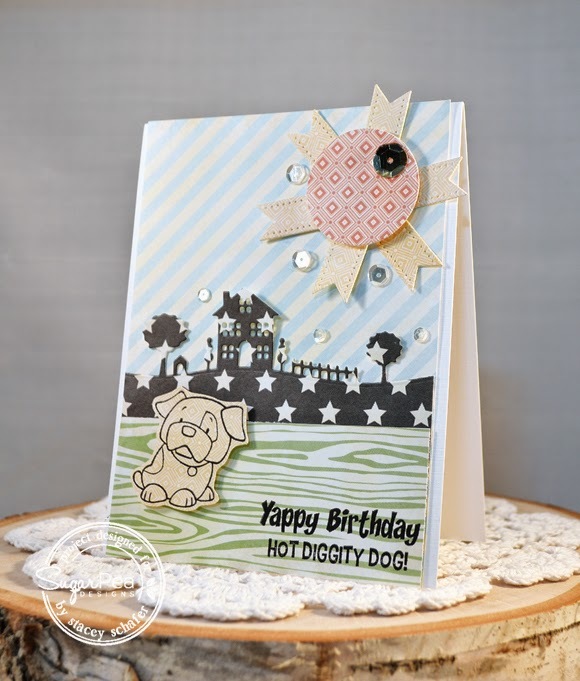 The two new release products that we are showing off today..the Hot Diggity Dog stamp set and SugarCuts - Homescape So fun! I'm a dog lover, so this new stamp set makes me smile! The new die is so awesome, too...so different from anything that I have in my stash! I added some element to my card, too, using the previously released SugarCuts - Layered Treat Labels and SugarCuts - Gift Tag. If you don't already own these, you'll want to add them to your shopping list..they're so versatile! The entire March Product Release will be available for purchase in the SugarPea Designs Store on Friday, March 13th at 6:00 PM EST! We would love to hear your thoughts on the products introduced today!! Please leave a comment on this post and on each of the talented SugarPea Designers shown below and you could WIN! We will chose one lucky person to WIN the Hot Diggity Dog stamp set from the comments left here and on the DT Blogs! All winners during our March Product Release will be announced on Sunday, March 15th. This scene was so fun to create! 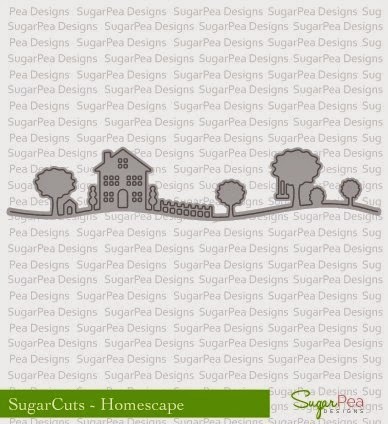 I stamped the sweet dog from Hot Diggity Dog over a piece of patterned paper and fussy cut to show him off with the new Sugar Cuts - Homescape. 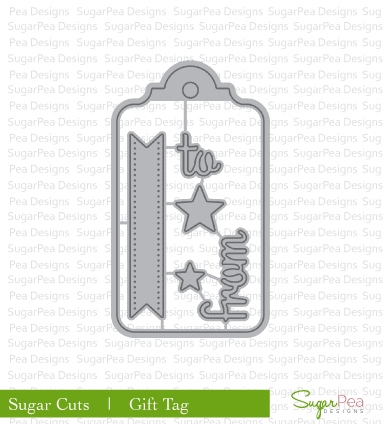 The sun was created with the previously released SugarCuts - Layered Treat Labels and Sugar Cuts - Gift Tag. A few sparkly sequins were scattered here and there for some twinkly shine! 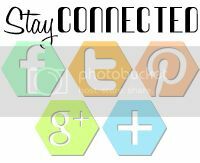 Make sure you hop through and see all of the Sugar Chic blogs for loads of inspiration! Love the patch work look to your card. LOOK at that card! Gorgeous! So talented! I LOVE your sun! Great idea. The rest of the card is pretty special too. This is so cute!! Great use of patterned paper!! Love it! The way you use patterned paper is crazy! (in a good way) This is super cute. I know I say it all the time, but you have an amazing talent for mixing and matching patterns together. Blows me away every time! 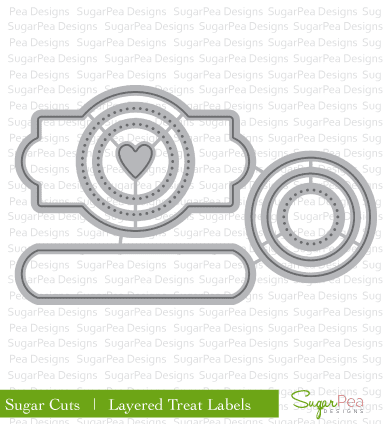 And I completely ADORE how you created the sun with the SugarCuts Gift Tag and Layered Treat Labels dies!! Pure Brilliance!! Great card - love all the papers! What a fab pup! and cute design!! LOVE it. It's so cute. Very creative scene you created. Very pretty. Love how the background papers provide the color. Really makes the dies and stamp stand out. I have the treat labels and dies so you gave me a great idea to combine them with the Hot Diggity Dog stamps for dog treats I make for shelter dogs! Cute combo of patterned papers for this sweet scene. This card is absolutely adorable!!! Fantastic card!! 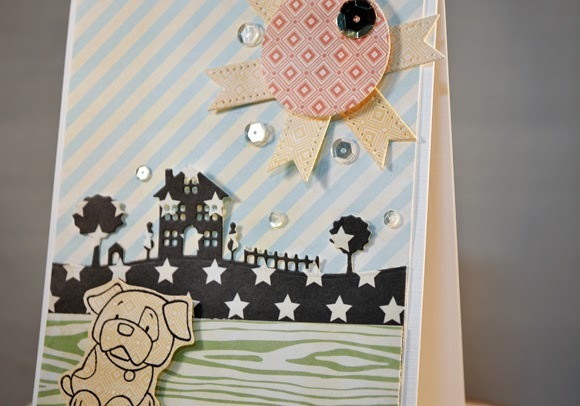 Love that you used pattern paper for the Homescape die!! Love your choices of paper/colors and patterns they work so well together! Loving these new dies. WOW! So adorable and love the scene you created! you create a fabulous scene! Super duper cute! Love it! Awww, what a fun card!! Cute card. Love the dog. Love this card and new set! What a cool mix of different patterns! Somehow it really works too! Cool beans!